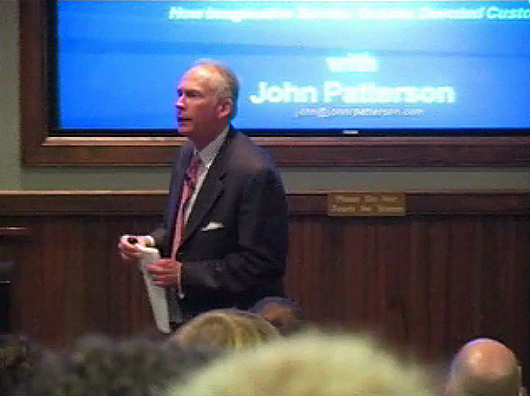 John R. Patterson is a contributing writer at Service Untitled. He co-writes his articles with Chip R. Bell. Full Biography: John is a sought after speaker on the topics of creating consistently great customer experiences that drive customer loyalty and growing business by creating, leading and sustaining remarkable service. John is the co-author of two books with Chip Bell including the national best seller Take Their Breath Away: How Imaginative Service Creates Devoted Customers and Customer Loyalty Guaranteed: Create Lead, and Sustain Remarkable Customer Service. His articles have appeared in Customer Relationship Management, Incentive Magazine, SBusiness, Quality Digest, Customer Service Excellence, M World, Sales and Service Excellence, and Leadership Excellence. He is founder and President of Progressive Insights a member of the Chip Bell Group. He has over 20 years of executive leadership experience in the hospitality, business services, real estate and financial services industries. John holds a graduate degree in business from the Darden School at the University of Virginia and a B.S. in Business Administration from The Citadel. His consulting practice specializes in helping organizations effectively deliver great customer experiences. He has successfully completed engagements in a variety of industries including the healthcare, financial services, senior living, insurance, quick service restaurant, utility, trade show management, wholesale auto auction, technology, hospitality, real estate, education and business services industries. His clients include, McDonald’s Corporation, Allstate Insurance, The Arbor Company, Sodexo, General Growth Properties, Texas Instruments, Olmsted Medical Center, The Freeman Comanies, Northeast Utilities, Banco Popular, EDiS Company, ELANCO (Division of Eli Lilly), Kaiser Permanente, FLEETCOR Technologies, Pegasus Solutions, Banco Continental de Panama, Southern California Edison, Cousins Properties, Navy Federal Financial Group, Hospitality Risk Controls, Manheim, Angelica Textile Services, Cannon Company, The College Board, and Compass Bank. John and his wife Katie have 5 children and two yellow labs and live in Atlanta. More: View posts written by John, check out his website, or follow him on Twitter. Back to listing of writers.